The trail left by the presumed meteorite. What seems to be a meteorite has struck the western Cuban town of Viñales, according to local news reports. 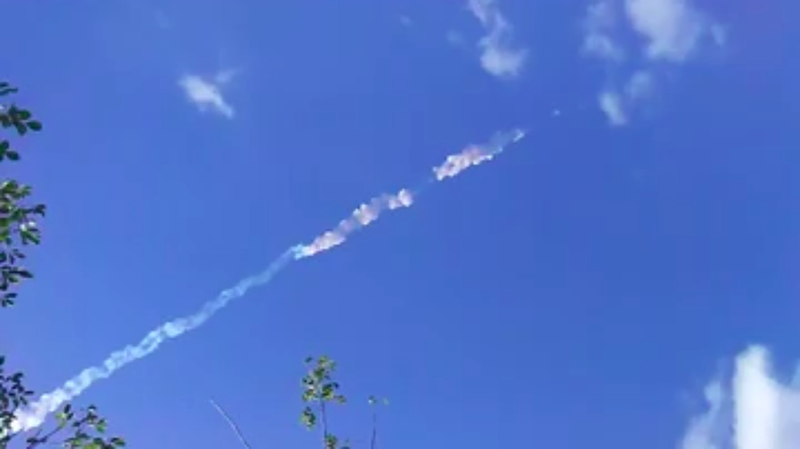 Residents reported loud explosions and a trail in the sky earlier this afternoon, and the U.S. National Weather Service confirmed having received reports of a meteorite seen in the skies above the Florida Keys. Reporters at the Cuban television station TelePinar tweeted that they’d found palm-sized black stones after the blast, ironically near a mural of dinosaurs. In the video below, what seems to be a sonic boom can be heard at 0:46. Objects moving faster than the speed of sound produce these loud shockwaves, which are powerful enough to break glass. One Twitter user noted that the meteorite appears to have been picked up by the GOES-East weather satellite. Meteorite strikes are more common than you might think. Dust-grain size meteoroids strike the Earth’s atmosphere almost constantly, but they often go unnoticed. Meteoroids between a millimeter and a centimeter burn up in the atmosphere and appear to us as shooting stars. Larger strikes are less common—a one-meter meteoroid strikes the Earth once each year on average and would reach the ground as smaller debris, while a 100-meter meteoroid strikes the Earth approximately every 10,000 years, according to a Tufts University fact sheet. Meteoroids over 1 kilometer hitting Earth are catastrophic events that occur every 1 million years on average. But medium-size strikes can be dramatic spectacles—and in some cases, dangerous. The Chelyabinsk meteor that struck southern Russia in February 2013 blew out windows and caused indirect injuries to almost 1,500 people. We will update this post as we learn more.